We have built a demonstration system showing a few of the ways an Asterisk phone system can be used in an OpenVMS environment. If you call 1-949-270-1979 you will be presented with a menu. The first time the items will be presented in a default sequence. However the phone system keeps track of the number of times each menu item was selected, so the next time you call in, the order of the menu items will change with the most selected options first. If you select option 5, your call will be routed to extension 666 which is a special extension for unwanted solicitations. Thereafter, calls from that same number will always go to extension 666. To view the data, go to www.keepmeuptodate.net, create an account (note that this is a demo web site running on our OpenVMS server) and select the "Phone Lookup" tab. You can then enter your phone number and see the accumulated information. If you had selected option 5, you will see a "Reset" button that will restore the old menu. Mouse over the descriptions below to highlight the components used. Incoming calls are forwarded to our Asterisk server via a SIP provider. 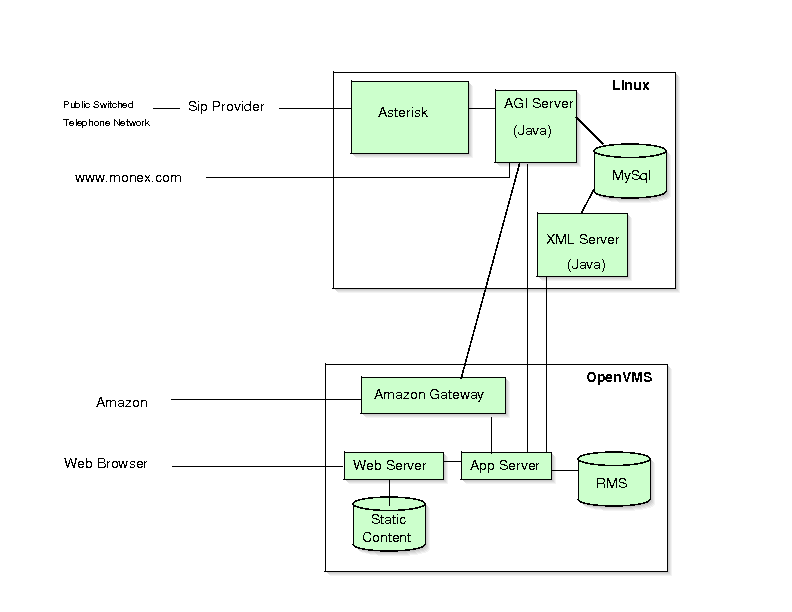 Asterisk connects to a thread on the AGI Server which combines data in a MySQL database with data from OpenVMS RMS files to determine how to handle the call. Information on commodity prices are read from www.monex.com. Information on ISBN numbers are read thru the Amazon gateway running on OpenVMS. Web requests for phone data are forwarded to the application server which accesses both RMS data and MySQL data via an XML gateway server.